How was your weekend guys? My mom had come to my place and so we had a good time together, shopping, eating out, etc. Its always nice when parents visit our place right? 😀 So today’s review is on Gulnare Goddess Rose Gold Elixir Dry Oil for Glowing Skin. Facial oils are the new trend nowadays, and if you haven’t tried them yet, you should start including them in your skincare regime. Not because it is a trend, but because they do magic to your skin! Ever since I started using facial oils, my skin’s texture has improved a lot, acne scars have faded, my skin looks healthy and glowing and also I have had far less breakouts than usual. This is because facial oils are packed with various nutrients, vitamins and fatty acids that help repair, renew and strengthen the skin. I have tried facial oils from few brands and I picked up this one from Gulnare when it was on a 50% sale. The terms ‘Rose’ and ‘Gold’ together intrigued me as well as the ingredients list. So let’s see how Gulnare Rose Gold Elixir performs. Add a touch of luxury to your beauty ritual with Goddess facial oil. Infused with 24K carat gold, saffron & rose petals, it deeply nourishes, conditions, and protects, leaving skin with a glossy, silky sheen. The formula locks in moisture, delivers antiaging benefits, and restores the skin’s glowing softness, elasticity, and comfort. The super ingredient in this magical elixir is rosehip oil, which helps reduce the appearance of fine lines, hyperpigmentation, and even stretch marks. Gulnare has recently revamped their entire packaging. The one you see in these pictures is the old one actually. 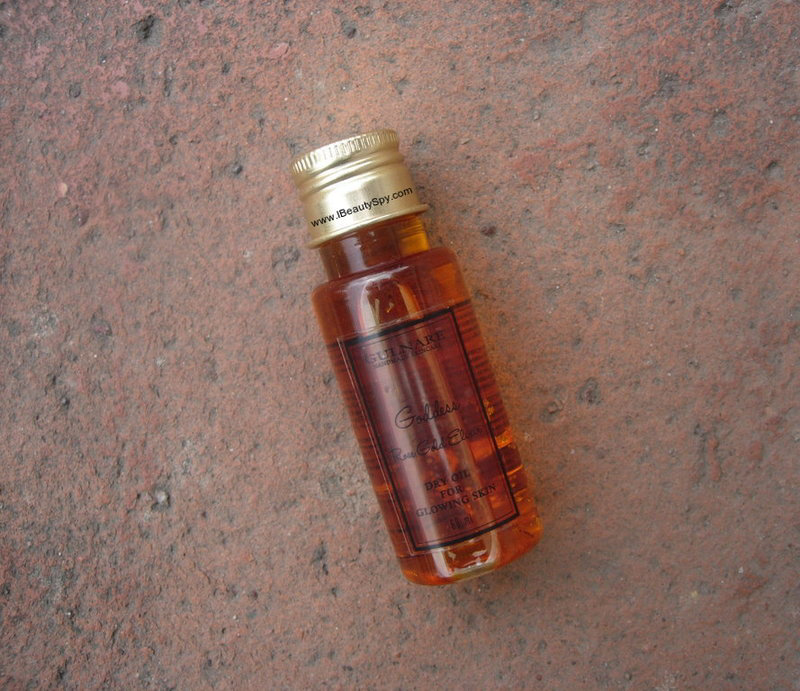 The new Gulnare Rose Gold Elixir actually comes in a glass bottle with a dropper which is better than this one. Gulnare Rose Gold Elixir looks orange in color. I am assuming it is due to the addition of saffron. Also there are tiny gold particles floating in the oil. And there is a decent amount of them, not very less. 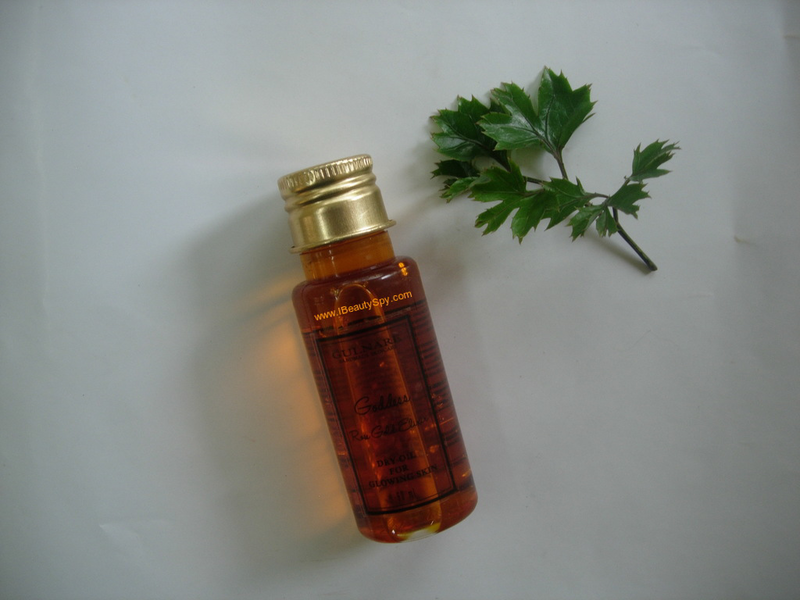 The scent of rosehip oil is prominent. There is no other artificial fragrance. Gulnare mentions this as a dry oil. The term sounded new to me, as how can an oil be dry? So I googled to understand it. So basically, dry oils are lightweight and quick absorbing oils. Popular dry oils are avocado, rosehip, evening primrose, sesame, grapeseed and argan. Wet oils, on the other hand, are slower to absorb and they form an occlusive barrier on the skin. A major benefit of wet oils is that they help in reducing transepidermal water loss which makes them perfect for cracked, dehydrated skin, treating eczema and inflamed skin conditions. 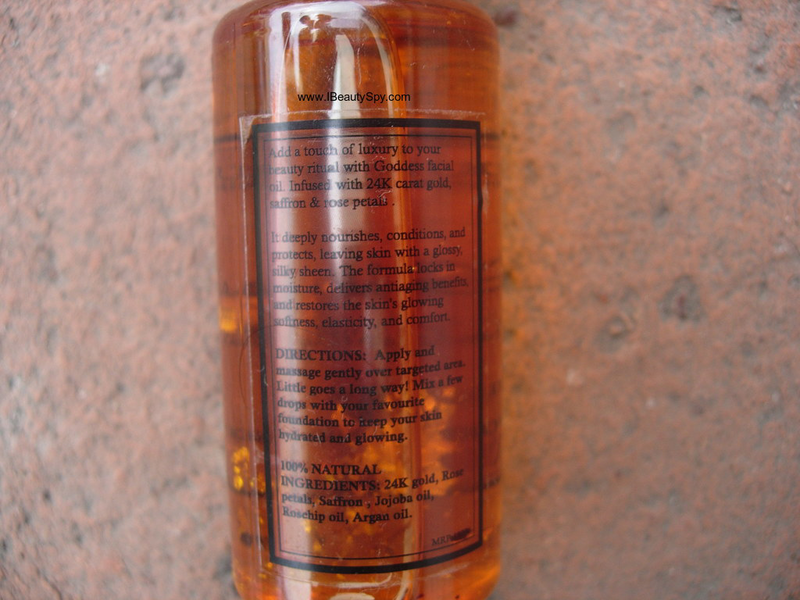 Popular wet oils are neem, coconut, castor, jojoba, tamanu, sweet almond and apricot. Dry oils need to be applied on slightly damp skin. Initially I was using Gulnare Rose Gold Elixir on dry skin and I couldn’t massage it properly as it had a thick consistency. Later I started applying it when my toner was still damp on my skin. In that case, I need only two drops of the oil and it is easy to blend and massage into skin. I found the texture and the absorption time similar to rosehip oil. Gulnare Rose Gold Elixir serves as an excellent moisturizer as well as serum. If you have oily-combination skin, you won’t need a separate moisturizer after applying this. It takes care of the dry patches on the skin and makes it soft and supple. My skin was dull, dehydrated and tired looking initially. And I had lot of acne scars and pigmentation. Skin looked healthy and glowing. Few acne scars have started fading. But not completely. Skin looked brighter and radiant. Pigmentation and tan has reduced. Few acne scars have faded completely. More are starting to fade. Overall, I have had a good experience with Gulnare Rose Gold Elixir. The price is my only concern. It costs Rs.1800 which is higher than many other facial oils available in the market. But we get 30ml of the product and only 2-3 drops are enough, so this lasted me for around 3 months. Just be cautious with the quantity you use else it can make face look oily if you go overboard. The ingredients list is really impressive with the best blend of oils – jojoba, rosehip and argan. And also contains 24k gold, saffron and rose petals. All are expensive ingredients. They are full of antioxidants, vitamins A, B, C, E, essential fatty acids, omega-3, carotenoids, flavonoids, trans-retinoic acid, polyphenols. Wow! * Moisturizes and takes care of dry patches. * Doesn’t clog pores or cause any breakouts. * Gives healthy and glowing skin. * Makes skin soft and smooth. * Works on acne scars and pigmentation. * Protects skin from pollution and environmental damage by forming a thin barrier. * Very good ingredients list, all of which deliver essential nutrients and vitamins to skin and help in brightening as well. No. There are lot of facial oils available nowadays and I would like to try other variants and brands. Slightly on the expensive side. Gulnare Goddess Rose Gold Elixir surely makes you glow like a goddess. It not only gives glowing, radiant skin but also repairs and protects skin. Considering the ingredients list, I would say it is real food for skin as it contains the vital nutrients and vitamins. Add a touch of luxury to your beauty ritual with this facial oil. If you can afford this beauty, do give it a try! That’s all for today, folks! See you in a new post! 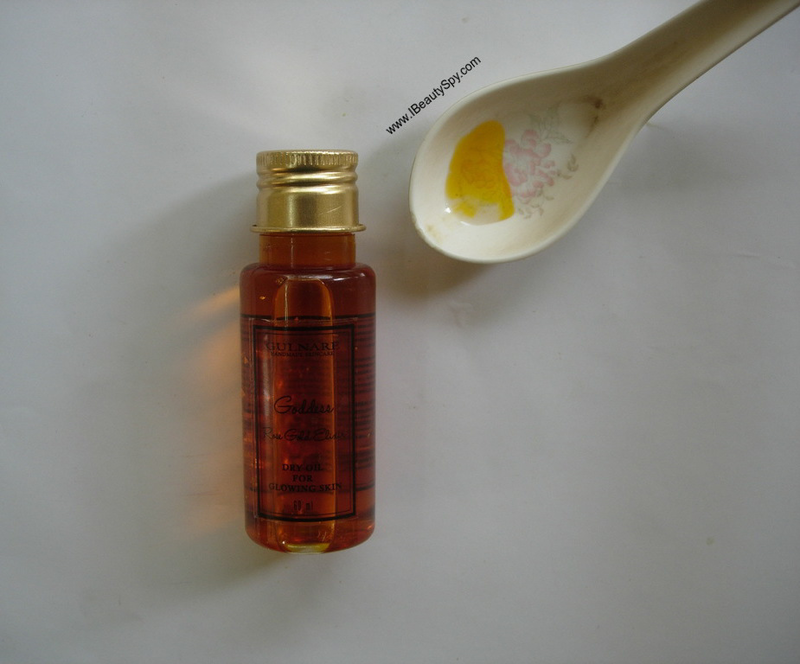 * Review of Auravedic Kumkumadi Oil | Comparison with Auravedic Skin Lightening Oil – Which One Should You Go For? Loved your detailed review. All Gulnare products seem to be good except the price point 😂. But since they are 100% organic, price will be higher then others. this oil seems a magical product. i too love facial oils as they hydrate my skin so well. oh, sad to hear that. You ordered from their website or Amazon?